Most households have more than one computer and often need Wireless access to the internet. The most common internet providers on the San Francisco peninsula are Comcast and AT&T. The fastest internet service in the San Mateo area is provided by Comcast cable. Connect more than one Mac or PC to the internet. 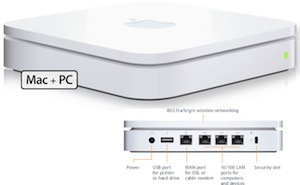 Besides these desktop or laptop computers there are often other devices like Apple TV, Game consoles, TV's and DVD players that benefit from an internet connection for services like Netflix and Hulu etc. Call us old fashioned but a wired network using fast ethernet connections is still the best way to connect to the home or office network. Leaving space on the WiFi network for laptops and portable devices like the iPhone, iPad and other smartphones and tablet computers. Many networks are slow due to a wrong configuration and interference from other wireless routers, cordless phones and even microwave ovens. Contact us to set-up and resolve network and internet problems. We offer enterprise level Wireless networking solutions by Ubiquity.